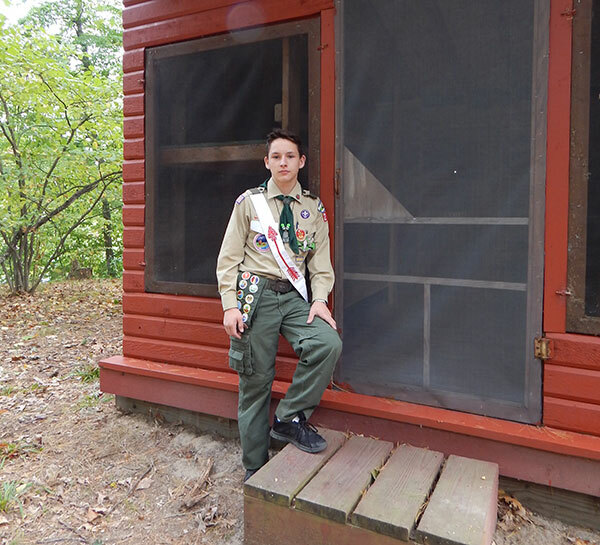 Tag Archive | "Cedar Springs Boy Scout Troop 222"
Nicholas Bromm, of Pierson, completed his Eagle Scout project at Camp Greenwood. Camp Greenwood, in Gowen, now has several renovated cabins thanks to a local Boy Scout’s quest for his Eagle Scout pin. 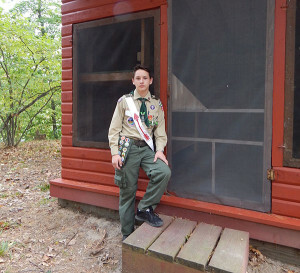 Nicholas Bromm, 15, a sophomore at Tri County High School, and a member of Cedar Springs Boy Scout Troop 222, completed his Eagle Scout Project at Camp Greenwood on September 26-27. He and 10 other boys and adult leaders repainted five Adirondack cabins, installed fire escape hatches on the back of each cabin, and built a fire wood shelter. Some materials were donated by local businesses, and additional funds were donated by various businesses in the Tri County area. Camp Greenwood is a ministry of the Presbytery of Lake Michigan and provides various camp programs throughout the summer. Nick will now finish his project paperwork, and his Eagle Scout application, and submit it to the Gerald R Ford Council for review. He will then have a final board of review with members of the district council. Nick is the son of Amy and Gerrod Bromm, of Pierson.